courtesy of the creative designer of The Sunroom. Aileen is a “fibre artist and independent designer” who creates beautiful crochet & knitting patterns for sale, as well as publishing free patterns on her blog. Visit her blog for more crocheting inspiration! 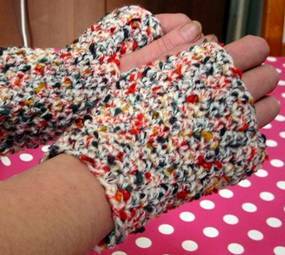 A quick and easy project for some practical fingerless mitts to keep hand and wrists warm during the winter chill. Can be made for him or her and a quick and easy gift. Materials: 5mm hook, 50g of DK yarn, tapestry needle, crochet stitch marker. Notes: These mittens are crocheted in the round and you may need to use a stitch marker or safety pin to mark rounds. Before beginning mitts please measure around palm to get correct size. If you use a yarn with good stretch the mitts will fit better. Measurements: 6″, 7″, 8″ – around palm. Rnds 1-6: ch 1, work 1 sc into each ch to end of rnd, join with a sl st.
Rnd 7: ch 1, work 1 sc into next 10 sts, ch 3, sk 3 sts, work sc into all remaining sts, join with a sl st.
Rnds 8 – 13: ch 1, work 1 sc into each st to end of rnd, join with a sl st. This pattern is written using USA terminology. Please refer to the conversion chart here to make changes for UK crochet.